What is an espresso? There are many definitions. For me, I think espresso is a singularity of a beverage where you have the balance between sweetness, bitterness and the acidity,also while you consume it,your sensory triangulation is been evaluated within. Most commonly, today espresso is being percolated under 9bar pressure and having averagely around 93.5’C temperature. There are lots of parameters that can decide, how good or bad an espresso really is. Such as, Particle size, dissolved particles in the beverage, amount of the flavour compounds that have been transferred from solid form of the coffee to liquid form, and so on. Also, rather be extreme, and bias your espresso to mathematics, and then, if you subjected the soluble concentration to differentiate extraction, you can predict the yield of your espresso. Balancing or dialling an espresso every time to a given point where you have the, sweetness, bitterness, acidity and may be the roundness of the coffee as evaluation parameter is considerably difficult, yet, at the same time balancing the same coffee to a given range become rather easier because, an espresso can be harmoniously balanced between above parameters by fluctuating the contrast of sweetness, bitterness and acidity. Therefore, there is a big uncertainty remains within the taste and flavour profiles of an espresso. As an example, the solubility product of protein in saliva can be a considerable decider of the intensity of espresso astringency. Hence these small, yet very important factors can be a decider when espresso is being evaluated. The roundness of espresso; this can be elaborated as how easily coffee particles are travelling on the surface of the tongue without being forced to do so. Then roundness of a coffee can be proportional to frictional coefficient of tasters tongue. Again, these important facts can be deciders at espresso tasting. 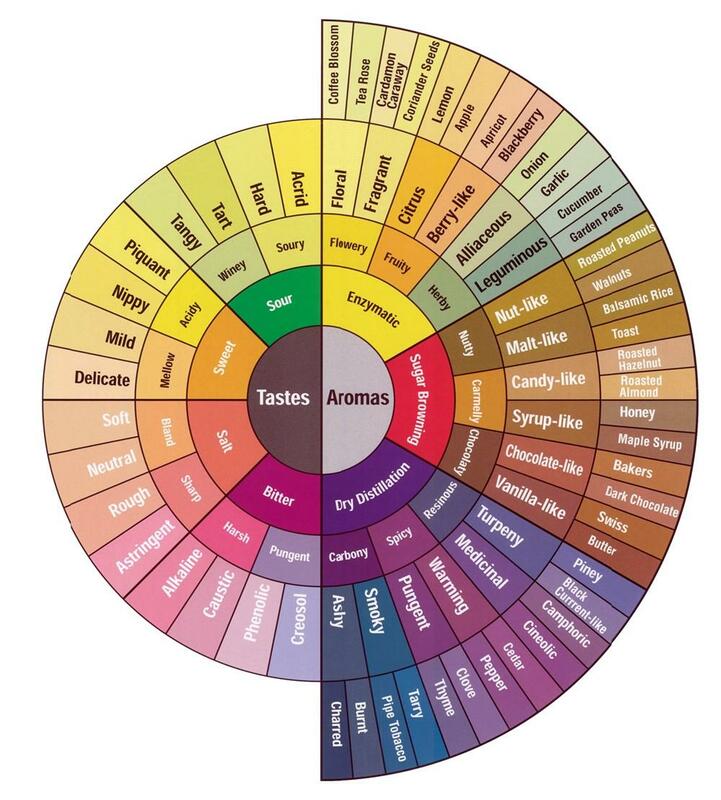 Understanding the flavour components playing one of the major roles in espresso evaluation while most of the tasters finding difficulties to understand what are the distinct differences between taste and flavour. Including fatty as a taste which can be identified via CD36 receptor. Therefore ,arguably, there are 6 tastes that human tongue can recognise.When olfactory epithelium being hit by volatile particles while taste buds are detecting H+, Na+, Sugars, some of the proteins and alkaloids, TASTE become FLAVOUR. The very focus that a tasters use to find a flavour descriptor can be drive their attention away from recognising or meeting many others. This phenomenon weirdly remind me of Werner Heisenberg’s Uncertainty principle, which is “the very concept of exact position of an object and its exact momentum, together has no meaning in nature”. This tells us that very try that you use to find where a particle is will not let you find the very momentum that particle has. Hence trying to find a point that has the perfect flavour or taste profile of an espresso can be disappointing within this uncertainty of espresso. However, understanding an espresso is the most important aspect of espresso evaluation.When an espresso is percolated to its optimum balance via sensory triangulation, the barista will become a master of espresso gastronomy. Therefore, there are no perfect espressos, but a spectrum of optimum balance and the disappointment of certainty. Tags: barista, chemistry, coffee, coffee chemistry, coffee science, espresso, extraction, flavour, SCAE, sensory triangulation, speciality coffee, taste. Bookmark the permalink. Great post, I always appreciate a little everyday chemistry! Love that photo too, btw. Did you take it? chemistry does help us to understand the unseen better. yeah,the photo was taken by me. Would you mind if I used the photo for a future blog post? With credit to you, of course. Sure, no problem. You can use it. I don’t mind. Good read! Didn’t expect to see that big about Werner Heisenberg! Cheers. Thank you espresso man. Heisenberg’s principle is awesome, so is coffee. Once we combined both together, Its a delight.